Several months ago, Sun gave us the opportunity to look at a quad Opteron, 3U rackmount server that had everyone reevaluating Intel's dominance in the server arena. Four months later, AMD finally has some significant market share for entry level servers. Our original quad Opteron 850 server was an impressive piece of machinery, but since AMD's launch of dual core processors, a whole new class of high performance entry servers has evolved. Sun was extremely pleased to announce to us that their dual core V40z had set the 64-bit SPEC JBB2000 World Record. We couldn't have been more excited to get a similar configuration for our testing to do some real world benchmarks for ourselves! Today we will look at one of these high performance Sun Fire V40z machines and see how they compare against the previous generation of V40z. Since we are looking at an 8-core Opteron server today, a huge portion of our time will be dedicated to investigating scalability. While it is relatively hard to take an operating system or application and design it to run on two processors instead of one, it is also equally hard to take a system designed for two processes and scale it to eight. The cost prohibitive nature of 8-way systems traditionally make scaling defects difficult to really ascertain, and likewise its not too often that we even pay attention to them. With processors heading toward dual and eventually quad core, scalability of the OS and hardware begin to carry more and more weight. For anyone in the computer business, there really isn't a better feeling than seeing 8 Opterons POST. 8 way jbb2000 world record - right! #34 That is plain stupid, it isnt from been taken out that it will protect him (if thats the true), or the microsoft guys cant read forums where the article have been already posted. Microsoft only have to look for who usually talk with anand. There is miscalculations about percentages, those are calculated wrong.
" 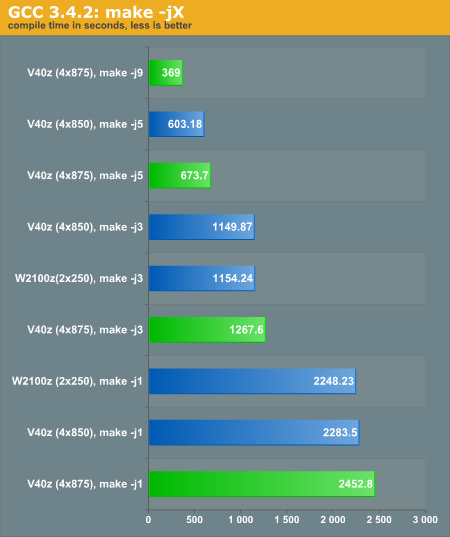 We see a 43% performance increase over the quad Opteron 250 V40z; certainly impressive but we would like to see more." But actually it's almost 64% since there is no point in comparing 5 threads vs 5 in a 8core system..
Den: Very true but recall that our previous test was done on Opteron 850s instead of Opteron 852s. The 852 performs a bit better than th 850.
opus13i: We have been stuckin MI redtape land for some time. It wouldn't make sense to change the benchmark at this point either because our previous tests used the 32-bit single core solution. Since they don't seem to have much desire to provide us with the correct license we will probably drop that benchmark in favor of something a little more versatile. Did you even bother to check with mental images? 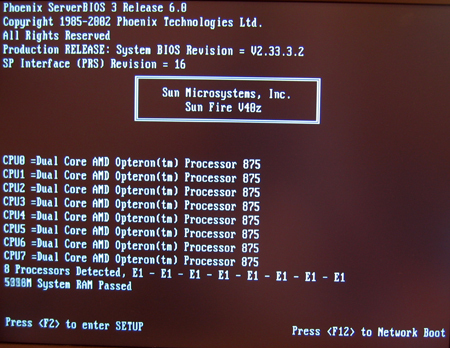 With a simple phone call you could have had the proper licensing in place for 8 cores, as well as every possible variation of 64bit possible. "We include Mental Ray and Shake as a point of reference, although both applications are strictly 32-bit at this time. Mental Ray is further hindered by the fact that the version we have is not SMP-aware." way to go detective, i dont suppose you actually looked at teh specifications did you?